No vacation pictures or stories yet...I am SO sick with the flu! The bug hit us the day we got back from so. ca. Me, Lilly and my poor baby Aaron are all sick, although I seemed to have gotten hit the hardest...hmm...maybe it's because the kids got the flu shot & I didn't...hmmph...too late now!! Hope to talk to y'all soon, for now I'm taking some Theraflu and going back to bed!!! Goodnight. It's 1:20 a.m. Saturday morning and I just finished packing for our mini vacation, we're leaving in about 4 hours!!! OK, so I always wait until the last minute! So here we go, Gerardo is so excited, I think more excited than the kids. Our trip will include a visit to the Queen Mary, the Aquarium of the Pacific and San Pedro for shrimp and lobster!! Then two days in Disneyland and California Adventures, then a trip to the Los Angeles Natural History Museum!! We are so excited, so here we go, I will let you all know how it went....ttyl!! My husband is my life. He holds my heart. He guides my soul. And I miss him so much. I only see him 8-10 days per month. Most days it's okay but some days, like today, I miss him so much it hurts. Everything around me reminds me of him and I feel all alone because he's not here with me. I know I can talk to him and he will reassure me that everything is okay, but I just wish that we weren't in this situation. We are probably going to be living like this for at least another couple of years until we can buy a house closer to Stockton. So we'll just have to get through it somehow. Support from our family and friends really gets us through. Like I said, most days it's not that bad, but today I missed him so much I didn't know what to do with myself. Today Aaron started to crawl (backwards only), it was so special to be there at this moment of accomplishment for my baby, but it was sad because Gerardo wasn't there to share the moment with us. I feel guilty for this because it is because of me that Gerardo works so much, so that I can stay home with our kids. He says he doesn't mind, but I still feel guilty and hurt. I can tell you that I love my husband so much, he just completes me in every way. I know you're probably thinking that I'm just feeling sorry for myself, and that could possibly be true, but nonetheless, it hurts the same to miss him. 1. He makes up songs and sings them around the house. 2. He always wears socks and only takes them off to shower. 3. He likes to jump on the trampoline at my parents house. 4. He shakes in his sleep. 5. He writes a love letter to me every year for Christmas. On February 10, 2008 Gerardo was honored to become Baby Damian Sotelo's Godfather. He was really excited and overjoyed that his little sister asked him to be Damian's Godfather. The day was very special and a lot of fun. I love this picture because you can see all the beautiful water droplets of Holy Water, such a special spiritual moment. All done, they both have wet heads...Baby D from the Holy Water and Gerardo from sweating in the hot church! Proud Nino & Nino with Baby Damian. My Lilly is such a girly-girl. She loves princesses, the color pink and anything with glitter! So, I had to take her to see Disney On Ice Princess Wishes. She loved the whole thing. 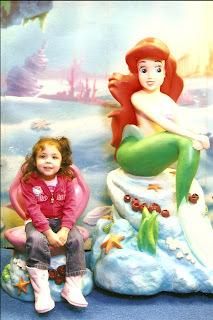 She sang all the songs, especially to The Little Mermaid. That is the movie that she is obsessed with at the moment. Well, she will always be my princess and hopefully she'll stay sweet 4ever! "Oh, those eyes", everyone seems to comment on Aaron's eyes. Beautifully brown and almond shaped, with the most killer eyelashes that you've ever seen. His dad says that he will drive the "ho's" crazy. Yeah, that's really what I want for my sweet baby boy..ugh, men! But I don't have to worry about all that for awhile. For now I will just enjoy the sparkle in my baby's brown eyes! January 27th, 2008 my "baby" boy turned 11 years old. Only a couple more years until the teenage years...ugh! We had his b-day party at the OH Wow Nickel Arcade. It was kind of fast because we only had an hour, but it turned out nice and the kids all had a lot of fun. Jacob was so excited, it was really funny. He got tons of great presents. When he was opening his gifts, I had to help him because he was actually shaking with excitement!! Daddy with Aaron, who was in love with the balloons! Tia Mimi trying to get baby cousin Ollin to smile, but he was too busy eating pizza!